If you like fast cars and want to know how to draw one then this is a great drawing video which allows you to follow one particular artist sketch a Ferrari Scuderia in time lapse. This video acts as a guide for you to follow the steps of how a car is drawn and to follow the progression from start t finish. The sketch artist begins by drawing the basic geometric shape to gather the rough size and perspective of the Ferrari. Once this light pencil work has been drawn onto the paper the shell of the car is drawn in using a series of guidelines to establish the proportions. Once the linear pencil work is drawn (possibly using a HB pencil) the artist then moves on to establishing the individual components which create the make up of the Ferrari. As a beginner to art this video will help you see the initial stages which are undertook to fulfill the dimensions of the supercar as well as offering good visual insight into how the various panels are shaded and rendered to get to the final design. There are many different ways to take on the drawing of a car but this video definitely ticks the boxes for producing a well detailed and proportioned pencil sketch of one. Drawing the human face can be extremely difficult when you are just starting out as an artist, sometimes it isn’t always the learner artists that struggle but also the more experienced. 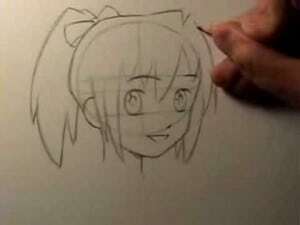 What is the best way to learn how to draw the human face then? You could learn from a book if you find that manually reading through the individual steps is the best way for you. Or you could get taught first hand from an artist or by attending a drawing class (this can become expensive though). Or you could watch at your own pace with a well narrated art tutorial video such as this one which covers all the bases and provides you with all the essential tips and techniques to familiarise yourself with drawing the human head and face. Prepared with only a black Prismacolor black pencil, drawing paper and experienced knowledge on art�surrounding the human anatomy the artist featured in this video guides you through the different stages and reasons�involved in drawing the face such as proportions between the different features and the use of guidelines to make the process of drawing much easier for you. This is the main basis of this video but the artist from www.thevirtualinstructor.com also touches upon some basic shading principles to help you develop some depth in your face as you perfect your proportions whilst you’re drawing. Basic cross hatch shading techniques can be a very quick way to develop tone and values within your drawings. I hope this video aids you in the way you tackle your future drawings and has been helpful to fulfil your artistic requirements. Here we have another excellent video art tutorial from leading manga and anime artist Mark Crilley where this time he shows you how to draw a couple kissing but placing emphasis on the pose more so than the actual kiss itself. He begins by drawing a rectangular box roughly on a 45 degree angle and divides this with a vertical line and a horizontal line. This box will form the basis to hold �the proportions of the two manga character’s heads and their upper bodies which just makes everything much simpler when you apply further detail to your drawing. Crilley explains that the standard and most recognised shape for a manga head is almost a resemblance of a tear drop and so he draws in very lightly with his pencil two of them in the two right hand side boxes. There is an additional diagonal line drawn in which goes from the upper left to the lower right of those right hand boxes and this will be a key line to align the manga facial features especially the eyes. The left hand boxes as Crilley explains is reserved for the male manga character’s shoulder and upper arm and also the exaggeration that is needed for the female character’s wrist in the sense that it is important to make the wrist more narrow and delicate to emphasise the male masculine body. Again this is all drawn lightly in pencil gaining all the correct proportions and as Crilley says at this stage a lot of the picture you are drawing is�interpretative so really use your eye to study what you are drawing and ask yourself questions like ‘Does this look in proportion’ so that if it doesn’t it easy easy to erase and amend. Throughout the video you will draw of a lot of features and and really get to grips with visualising how a manga pose should be drawn and if you follow Mark Crilley’s step by step instruction then I would say you will have accomplished a very advanced layout in the world of manga and anime. So reach for your pencils and get going with your romantic manga drawing. In this video tutorial you will learn how to dry brush with Claire Watson. The first half of the video describes the variety of brushes used and not forgetting the kitchen roll and the eraser. The paints are Windsor and Newton artisan oils and they are her choice of paints for the dry brushing. 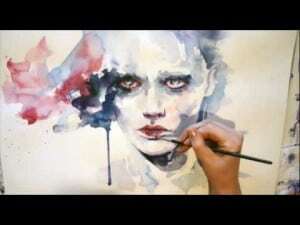 She talks of how its like a combination of drawing and painting. Judge for yourself and above all, have fun.